After having exceeded the growth rate of the PC industry for five-and-a-half years (22 consecutive quarters), Apple’s Mac platform now commands a 5.2 percent share of the worldwide PC market, according to an analysis by Needham & Co.. This is the first time in fifteen years that the Mac’s share has exceeded 5 percent, as AppleInsider points out. Apple reported record Mac sales of 4.89 million units during the recently ended September quarter, which was a growth of 24.6 percent from the year-ago quarter and much higher than the PC industry’s overall growth of 5.3 percent. 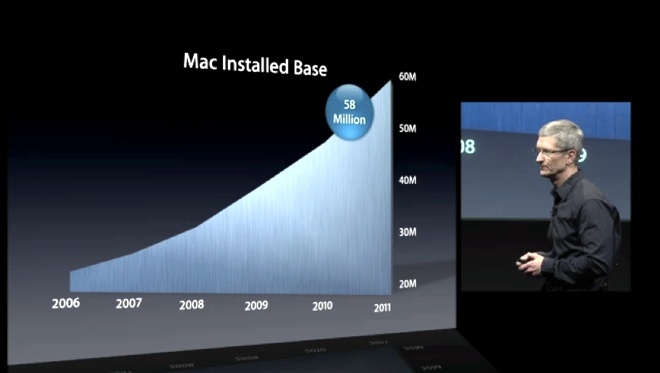 Apple’s Mac market share was at 4.4 percent at the end of the September quarter in 2010. Analyst Charlie Wolf noted that Apple’s numbers were even more astounding in light of the fact that the company had shipped more Macs in just the three months of the recently ended quarter than it ever did annually before 2006. Perhaps unsurprisingly, given Apple’s historically healthy margins, Apple’s share of worldwide profits was at 14 percent, much higher than its market share. What is surprising, however, is Apple’s resurgence in the enterprise segment, where the company saw gains of 43.8 percent in the recently ended quarter, compared to the 4.8 percent increase in the rest of the PC industry. Part of the increase in enterprise adoption was attributed to the immense popularity of Apple’s consumer electronics like the iPad and iPhone, which lead companies to consider the Mac for enterprise use. As for the enterprise market, its not so simple: the people that use the products don’t decide for themselves, and the people that make those decisions are sometimes confused. Mac sales were less dramatic in the education market, where it posted a growth of just 2.9 percent, against the industry’s 16.9 percent increase, while sales in the government market declined by 0.6 percent. Wolf attributed the decline in Mac shipments in the education market to cannibalisation by the iPad, which Apple said surpassed shipments for the Mac in that market in June this year.